Following the club’s first ever ‘doblete’ in A Coruña both the men’s and women’s teams finished as Iberian Championship runners-up for the 2012 season. Both titles were taken by the Madrid Harps, to whom we offer our congratulations. Heading in to the final tournament of the year, the race for the men’s ‘Pichichi’ was wide open with any one of 4 or 5 players in the running while the women’s scoring race was long-since decided. On the back of a 7 goal, 5 point performance in the year’s final tournament, Freddy Nadal collected the silverware for the men with a final tally of 13 goals, 10 points for a total of 49. Overall, 19 different players found their way on to the scoresheet for Sant Vicent this season, with 4 of them being ‘on-loan’ players or own goals. The men tallied 34 goals and 100 points for a total of 202 points on the year. The final scoring charts can be seen here. 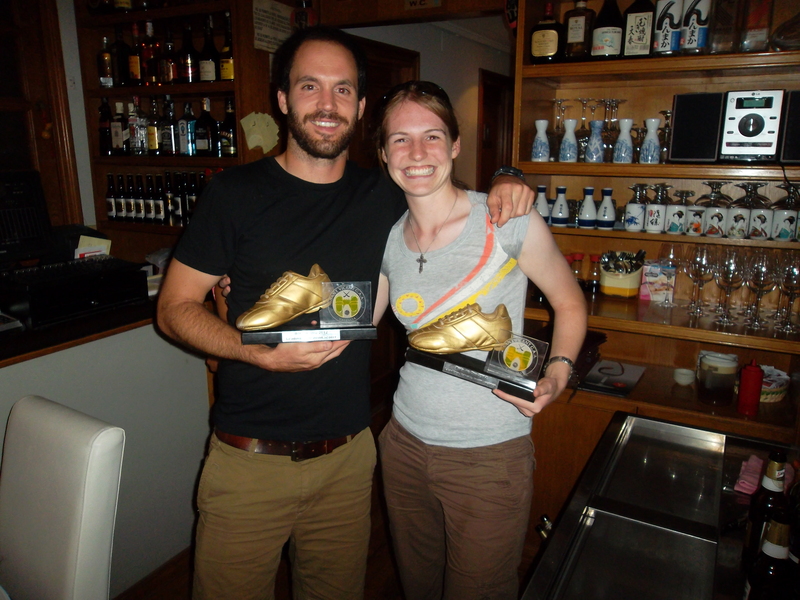 Pichichi winners, Freddy Nadal and Niamh Flynn accept their awards at the end-of-season dinner.